Flower pot can be placed in pots. The bar can hang some flower pots with hooks or flowers such as spider plants, and can hang the clothes also. Head support design can easily move the location. The top has telescopic function, can adapt to different balcony height. The upper contact surface is made of TPE material and has higher friction and will not damage the floor and walls. The dials and hooks have adjustment functions for freely rotating and adjusting the height up and down. Disk and hook have a storage function, save more space saving. The upper structure of the manganese steel spring structure, easy installation, with sustained support force, a higher degree of stability. Note: Due to manual measurement may have minor errors, the actual receipt of the product shall prevail. 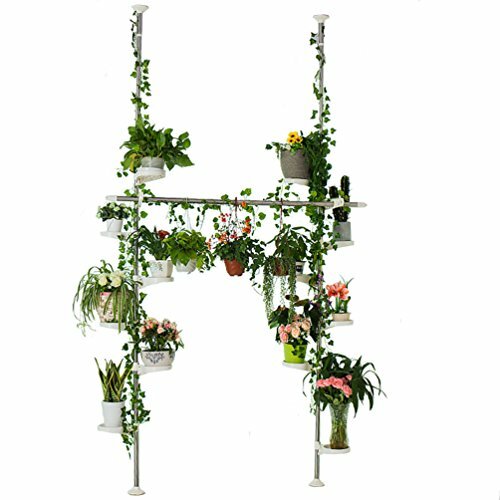 MULTI-FUNCTION: Rust-proof tension pole adjustable plant stands/flower racks/ clothes hanging rod, allows indoor/balcony/window use,designed for plant hangers, flower pot display and clothes hanging rod. STANDING DESIGN STORAGE RACK: With 12 trays , 2 hooks & 1 crossbar, can display 12 plant pots or flowers pots, the long hook above and the crossbar, you can hang clothes or hanging plants, the trays and hangers can rotate at 360 degrees. EASY TO ASSEMBLY:The installation is simple and sturdy, no tools required and no damage to your decorative wall, use the corner space to display the plants, give you a clean,tidy and comfortable home. ADJUSTABLE: The height can be adjusted by pull out the pipe, and you can adjust the height of the trays & hanger also. If you have any questions about this product by Baoyouni, contact us by completing and submitting the form below. If you are looking for a specif part number, please include it with your message.